Det er torsdag og tid for mitt første Designteam-bidrag for Moving Along With The Times. Denne ukens tema er "bursdag", og sponsor er StitchyBear Digital Stamps. It is Thursday and time for my first DT-post over at Moving Along With The Times. has chosen the theme "Birtday". valgte motivet "Rock on". Motivet har jeg fargelagt med copics. DT-members some digi to play with. For my card i choose "Rock on" and i have coloured it with my Copics. Takk for at du besøker bloggen min♥. Oh WOW! this is fantastic! Just love the embellishments you have used! This is a FANTASTIC card Marita.....BEAUTIFUL. Hi Marita and my goodness that is one fabulous card! Wonderful colouring of a great image and love all the embellishments. Welcome to the Team Marita - so good to be 'working' with you. 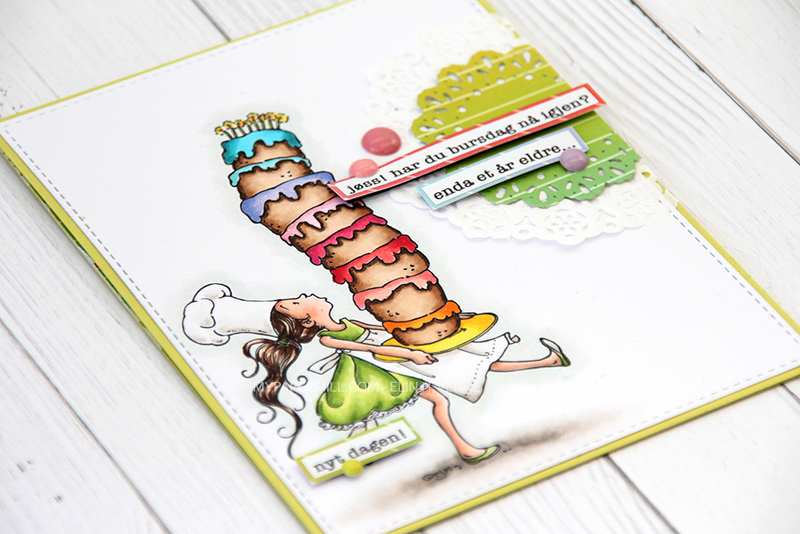 Fabulous card - stunning colouring and perfect embellishments. Oh wow this is a fantastic card, love all the detail and the embellies used. WOW this is awesome Marita! Gorgeous design and details! I love this! Ha en god helg og stikk gjerne innom bloggen min å-det er plass til flere.. Fantastic card!! And what a great details !! Wow sweetie I love this creations. Awesome embellishments and colouring. He really looks like he is enjoying playing his music. Oh Wow! this is fab Marita! what a wonderful image and you've coloured it beautifully! Love the wonderful papers and those fab cogs!! it's a really stunning card! Så utrolig stilig kort Marita, lekker pynt og et herlig motiv!